One of the worst things about watching sports live, is the price of the food and drink. Prices are absolutely ridiculous and you are pretty much stuck paying them if you wish to eat or drink. Most venues will not allow you to bring in your own food/drink and have no problem charging you upwards of $10 for a hot dog. Yet another reason why Great American Ball Park is my favorite baseball stadium ever – you can bring in your own food and they have an entire concession stand selling items for $1. While USF is finishing the spruce up of their on-campus Sun Dome, the basketball teams are playing in Tampa Bay Times Forum. So was where we ventured last Saturday to watch the USF men take on the West Virginia Mounties. We arrived at the forum just after the 12pm start time (traffic was insane). I knew that we were planning on eating a late lunch at Zim Zari but, I had to have a snack. After watching the first 5 minutes of the game, I got up to venture out. Since I am an over-planning, crazy, foodie freak, I already knew what Tampa Bay Times Forum offered for food. Aside from your normal fare, the Forum also has Outback and Mr. Empanada. As soon as I found this out, I knew I would be trying Mr. Empanada. I first purchased 2 bottles of water at a whopping $4 per bottle! Is this highway robbery or what?!?! Then, I grabbed two pretzels, one regular & one cinnamon – but, we won’t even discuss these…they were so horrible and I simply wish to forget them. After I had my water & other items, I journeyed to the Mr. Empanada concession stand. 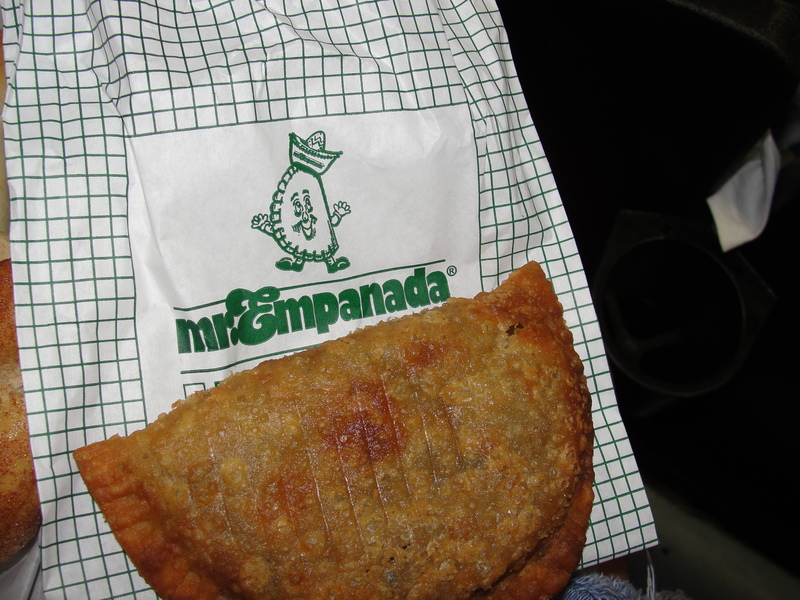 Mr. Empanada is a small franchise based out of Tampa. I have heard of these before, and seen them in Tampa, yet I had never tried one before. The offerings at the stand were simple – empanadas. I reviewed the menu – beef, beef & cheese, guava & cheese, crabmeat, spinach & artichoke – and was sold on spinach and artichoke right away. Myself, Mommy and Taylor all love the combination of spinach and artichoke and I was so excited that this was offered. I placed my order for two Spinach & Artichoke Empanadas and was almost jumping for joy when I found out they were Only 5 Dollars each! Woo-Hoo! 5 Dollars is basically free at the Forum especially after I paid $4 for a bottle of water! The Empanadas were served to me in little paper bags stamped with the dancing Mr. Empanada mascot. Each bag was very hot and I quickly hurried back to our seats. Once I arrived, I gave Taylor the first empanada. Before I even had a chance to take the other one out, he proclaimed it to be one of the best things he has ever eaten. With this in mind, I quickly unwrapped the second empanada and snapped a quick photo. It was then time to dig on in and see what this tasty treat had to offer. The empanada was very warm but not too hot. I took my first bite and my mouth was blasted with flavors. The outside of the empanada was crispy follow by a soft & chewy inside. The crust on the outside was fried to just the right amount and was not greasy in the least. I could taste the dough along with another flavor that I could not quite put my finger on. It was almost sweet in a way but not at all sugary. The exterior of the empanada was absolutely perfect. Now, the inside fillings were even better. The ratio of spinach to artichoke to cheese was spot on. I never felt as if I had a mouth full of any one filling. Rather, the fillings all worked together to produce a great flavor. The spinach and artichoke pieces were plentiful, fresh and tender. 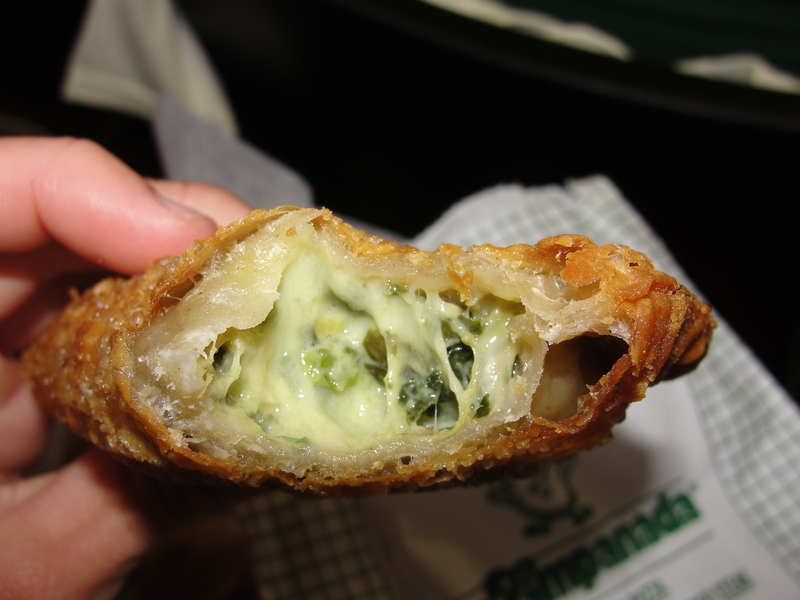 The cheeses used within the empanada were so melty and smooth and paired so well with the spinach & artichoke. I could have eaten this filling in a bowl with nothing but a spoon. The combination of the great shell with the fabulous fillings, provided us with a tasty little treat. The three of us quickly polished off the two empanadas and had we been eating a true lunch at the Forum, I certainly would have sprung for another. Once again, we come to the fact that when you use good ingredients & cook food correctly, you simply cannot go wrong. I hope that as Mr. Empanada continues to grow & franchise, that their commitment to serving a great product stays true. As long as it does, they will have no problem at all growing into a nationally known restaurant. Our empanadas provided great flavors both inside and out and were Only 5 Dollars! I am so very glad that we decided to try these. Even though USF did not win the game in the end, we had a great day. Even though this great snack was Only 5 Dollars, the winning part of my day, was once we left the Forum. 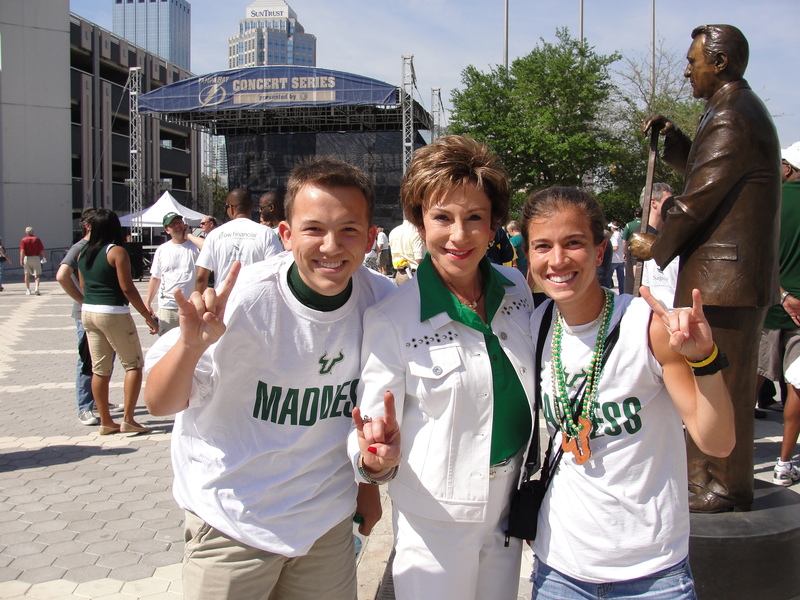 As we were walking outside, we spotted Mrs. USF President herself, our friend Judy. Hands down, my absolute favorite part of the day that Taylor and I still cannot stop talking about. This photo will surely go in a frame.